Whats this concealer!? Because they NEED to pass it out to everyone when the lights go on at 3AM…or maybe even Friday brunch. 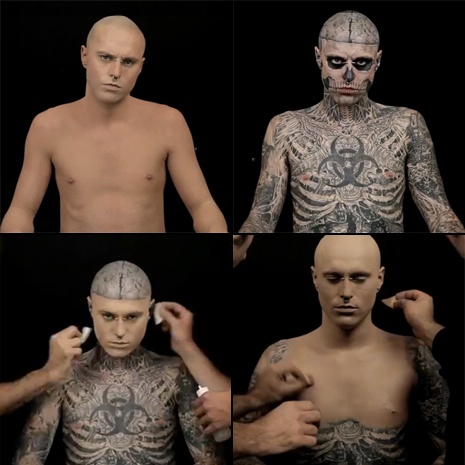 Zombie Boy, AKA Rick Genest, AKA Nichola Formichetti’s muse for for the relaunch Muglar, AKA the Tatoo boy in Lady Gaga’s Born This Way Video, is the new spokesperson for Dermablend. A behind the scenes and Zombie Boys reaction to his new look. « VIDEO SCREEN: TOM FORD DOCUMENTARY!